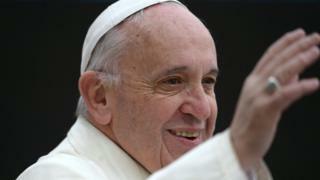 Pope Francis is more popular than any political world leader, an opinion poll has suggested. The poll by WIN/Gallup International indicates that Roman Catholics and Jews have the most favourable opinion of the Pope. More than half of the world's protestants and even the majority of atheists and agnostics view him favourably. BBC religious affairs correspondent Caroline Wyatt says that, three years into his papacy, Francis has enjoyed enormous goodwill and won the hearts and minds not just of Roman Catholics but also of people from other religions and the non-religious. Those taking part in the poll were asked: "Irrespective of your own religion, do you have a very favourable, somewhat favourable, somewhat unfavourable or very unfavourable opinion of Pope Francis?" The Pope was most popular with Roman Catholics, of whom 85% said they had a favourable opinion of him, and among Jews questioned the figure was 65%. Among the 64 countries polled, Portugal and the Philippines were most enthusiastic, with 94% and 93% thinking favourably of the Pope respectively. Pope Francis's lowest ratings came in Tunisia, Turkey and Algeria, while most people in Azerbaijan said they did not know much about him. WIN/Gallup said that the Pope heads the rankings when compared to the global popularity of political world leaders. It gave him a net score - the difference between favourable and unfavourable opinions - of +41 ahead of US President Barack Obama on +30; German Chancellor Angela Merkel on +13; UK Prime Minister David Cameron on +10 and French President Francois Hollande on +6. WIN/Gallup International President Jean-Marc Leger said: "Pope Francis is a leader who transcends his own religion. Our study shows that an ample majority of citizens of the world, of different religious affiliations and across regions, have a favourable image of the Pope."